I would like to Introduce my self as a new superhawk owner! I have 4 years under the belt with an F4i and cannot believe the change in ride of a Vtwin. I'm loving everything about this bike. Just purchased this 98 Superhawk in PA a few days ago and shes mostly stock which is incredible. 19k miles and pretty well kept, a few nics and scratches here an there. Tossed a pic up there for all to see. New handgrips are on there way and currently looking to do a two Brothers setup and Corbin solo seat with Cowl. Btw I appreciate the knowledge you all have put into this forum. I have learned a lot about this bike before purchase and commend those who are taking the time to share their experiences. I'm stoked to be in the community! Welcome aboard +1 on the color!! I used to live in southeastern PA, great roads back there and down thru Del and Maryland and West by god Virginia! Last edited by HRCA#1; 06-27-2012 at 07:22 PM. Depending upon ur size - meaning weight - I would suggest replacing suspension - if its OEM. Most SBs are set for someone about 170lbs. 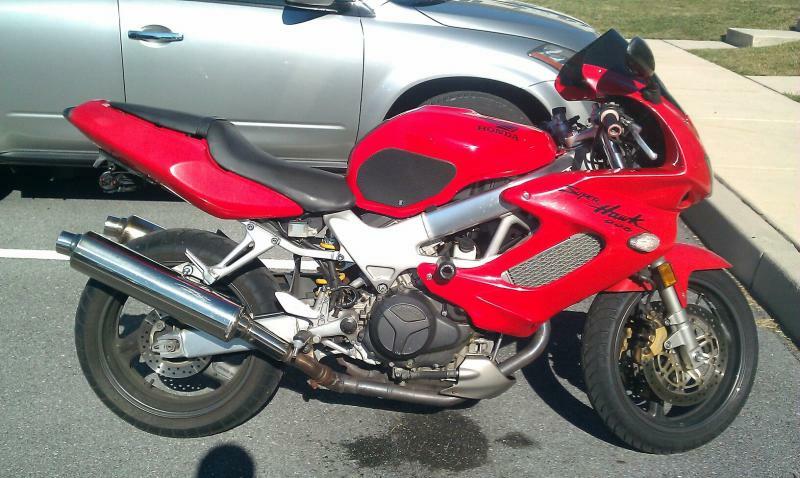 Welcome to the forum, kardiac996, and congrats on your nice looking bike. If you like to wrench on your own stuff...this is a good place to be. Yea I read a lot about this on here i'm 200lbs and will have to explore that option as I can tell the bike gets a little grungy in a hard corner. I appreciate the suggestion! Im def looking into doing work on my own.. I like to get my hands dirty. 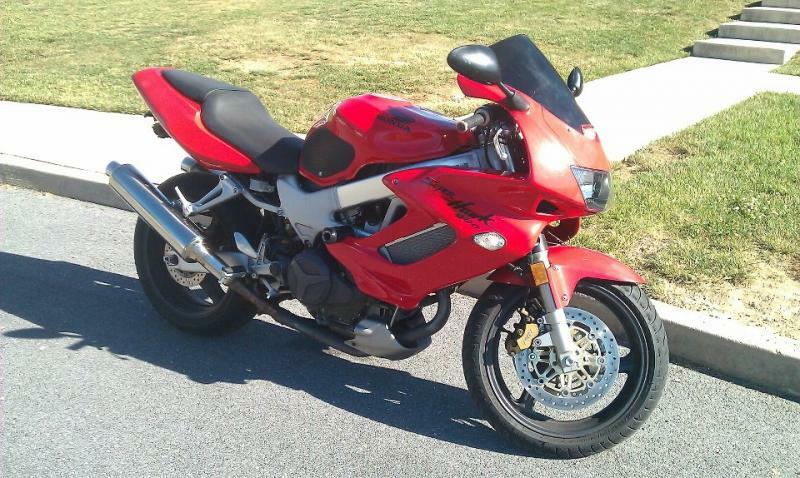 The VFR tank swap looks promising as the roads out here are long and beautiful and longer rides are pure truth. Have you all seen the Ogio No drag Mach series back packs? I just picked one up and its crazy awesome for commuters. Thanks all for the welcome, here is one more of her. Btw the puddle underneath isn't from the bike haha. Welcome!! LMK when you wanna gtg for a ride. I'm right on rt15 10 miles north Gettysburg! Hoovey and I just did a 100 mile loop that was awesome. If you don't know any roads "up here", you're in for a treat. Last edited by Wolverine; 06-27-2012 at 06:48 PM. Sounds awesome bro, nice Bikes! I'm out of Hagerstown MD about 2 miles from PA border greencastle PA area. 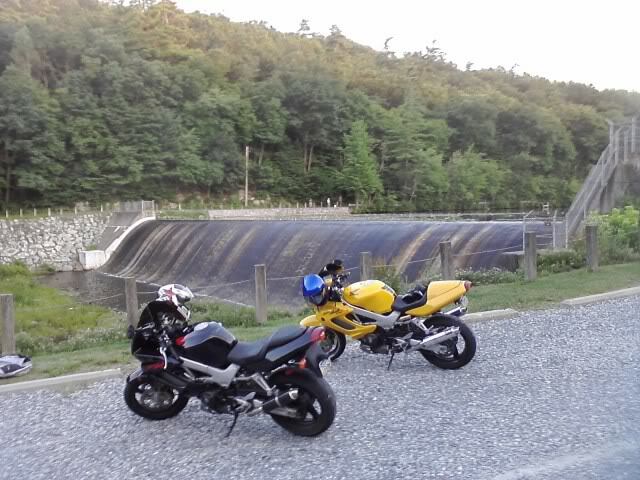 I got the bike out of Allentown and 81 had some breathtaking sights. Id love to get to know the area you have discovered. Shoot me a PM Ill hit you with my number and we can connect up. Yea this is a good call. I think I have the thread bookmarked, ill go re read it and start the plunge. Thank you for the reminder! Ill have to utilize the possible rainy weekend haha. Is it a general consensus to also have the PAIR removed? I read that it has benefits but are they strictly benefits when observing an issue with sputtering or backfires? or does removing it serve a greater good? Maniac shoot me your number in a PM we can sync up for a ride! Speaking only for myself, the biggest benefit I observe is less clutter near the carbs & valve covers which makes it somewhat easier when you're trying to reach in those areas for any maintenance. The pair is essentially the appendix of the bike. Honda woulda never put it on in a perfect world. It only kinda helps the emmissions at some rpm by putting clean air into the exhaust. I appreciate the feedback on this. There is certainly an appeal for a clean non cluttered look. Ill look into doing this then as i'm prepared to do my own work. Thanks Cranky for additional clarification. Sounds like a trip to me shoot me a pm lets exchange numbers! I de-paired mine when I did my Mccts, since I was in there already and had gotten my block-off plates previously. I took out the whole system. Everything is a lot tidier and as stated by the other members makes it a lot easier to access. My kit came with the plates and hose/airbox caps. I did not have a lot of deaccel pops running my two bros carbon slip-ons before, but I have none now. Engine braking seems a little more pronounced. Good to know! do you happen to remember where you got your kit from? Kits make things simple haha. I got mine (after looking for my paperwork) off a vender on fleabay. Since then I noticed that there was/are a few members on this forum who are selling them. Mine came from Powder Keg Racing-WI. It came with instructions and was fairly thick. Jake, the owner was very helpful and friendly. outside. I am very happy with them and the install went well, except my micro torque wrench decided to take a dump at the time and I had to tighten by feel. Got a new one the next day and went over the install retorquing everything. Engine braking seems a little more pronounced. Blocking the PAIR system will not change the engine braking as it is just injecting air into the exhaust system, though if you run carbon cans, they will last longer last longer. There's an excellent PAIR removal thread in the knowledgebase. Forum member Superdutyd makes very good plates very cheap. Anything else like vacuum plugs you can get from an auto parts store or make up from stuff you probably have laying around anyway. Thanks 8451H, maybe just less popping but I need to get repacking again. Boy they do let you know when they need it, especially after having ridden the VFR for all these months with its stock exhaust. I do remember Superdutyd making mod parts. Used some info and writeups that included him in my install along with the pair removal threads. Our threads are a wealth of knowledge and contain little inserts that general instructions do not contain. Along with great pics . Quick Reply: My new Ride! !